As you can see...there are many choices...How do you determine what specification is right for you? Wire Cloth is a highly engineered product but very simple to understand. There are literally 1000's of different possibilities. The first step to determine what the mesh is would be to count the number of openings per linear inch. The second factor is the wire diameter. 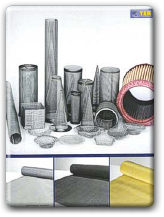 This method can be used for 90% of all wire mesh products being made today. Finer mesh might require high-powered microscopes to determine exact mesh counts and ScreenTek has this, plus many other tools to ensure exact duplication of your particular item. ScreenTek will match your exact requirement! Some customers require a certain percentage of opening to maintain flow-through. Our engineers at ScreenTek are experts in fluid technology. Send a sample or a print of what you have in mind and we will help guide you to a perfect match! ScreenTek can provide a broad range of samples to help you find the right product for your unique application!